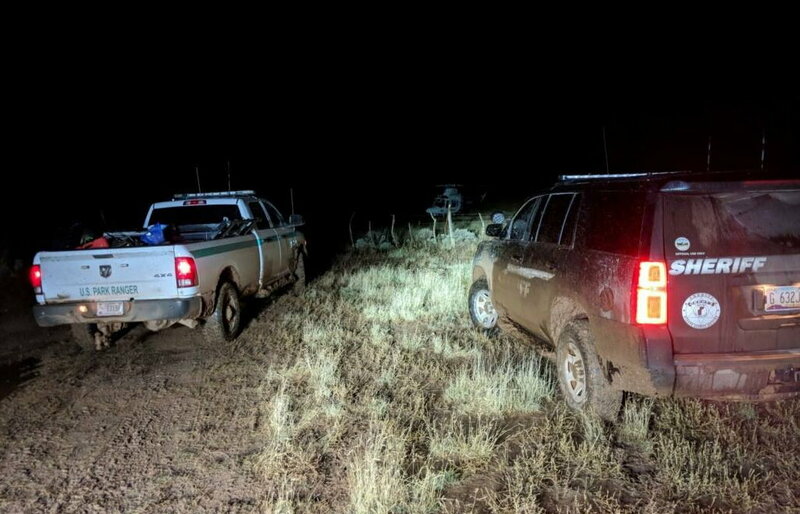 ST. GEORGE – The Mohave County Sheriff’s Search and Rescue responded last week to a group of dirt bike riders caught in a heavy rain storm near Mount Trumbull after one was injured. According to a press release sent out Thursday, the Sheriff’s Office received notification of a personal locator beacon that was activated Oct. 11 north of the Grand Canyon near Mount Trumbull, which is located approximately 60 miles south of St. George. The Sheriff’s Office said it received information that the beacon was attached to a group of six men between the ages 45 and 65 who had been riding motorbikes on a trail near Mount Trumbull when they were caught by a rain storm. They activated the beacon after one of the riders was injured. The group that tried to ride out of the area got stuck in the mud about 6 miles from the group that stayed at camp. A sheriff’s deputy and National Park Service ranger responded to the site of the original beacon activation. Search and rescue personnel were called in as well with utility task vehicles, and a Mercy Air medical helicopter also headed to the search area. Of the group that got stuck, two of the riders were dehydrated and disoriented and showing signs of hypothermia, according to the Sheriff’s Office. They were transported out of the area by Mercy Air for medical examination. As for the group that stayed put, one of them, a 45-year-old male, had a sprained ankle. He was also taken to a waiting helicopter that flew him out of the area. The remaining to riders declined medical examination and told search and rescue personnel they would wait for the roads to clear out so they could rider their bikes home.